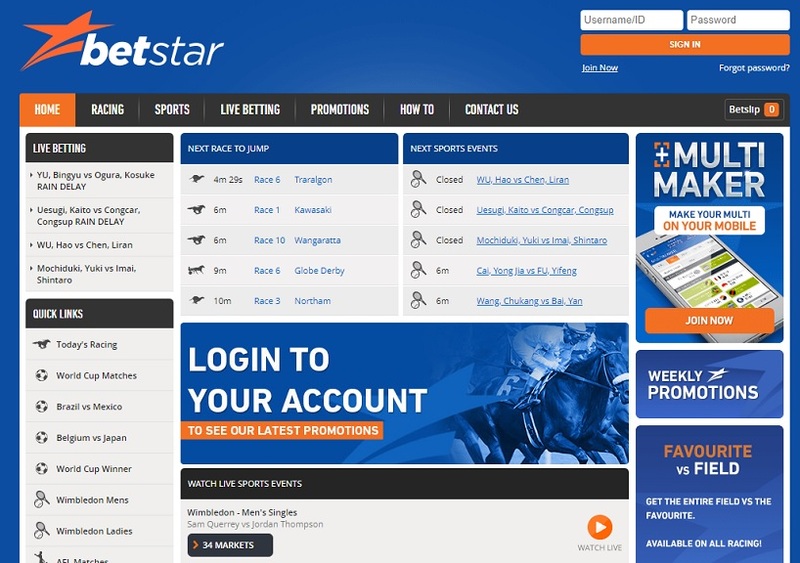 Betstar is one of the older Australian sports betting websites, having been established by the Eskander family in 2007. The company was wholly owned by the Australian bookmakers Michael and Alan Eskander until 2014 when Betstar was acquired by the UK wagering behemoth Ladbrokes. Since then, Betstar has continued to offer a great Australian online betting service and like Ladbrokes Australia, offers landmark products like the Betstar ATM Card. Find out more about Betstar bonus bets in our full Betstar review. Punters familiar with Ladbrokes will notice that Betstar.com.au features a very similar layout and in fact offers all the same sporting events and odds as its sister site. The major difference between Betstar and Ladbrokes, in terms of the look of the betting sites, is simply the colour scheme. Regardless, like Ladbrokes, Betstar is a very user friendly site and make it an enjoyable betting experience for Australian punters. Like many Australian sports betting sites, Betstar seems to have a focus on betting on horse racing. TYhis is clear by the ‘Quick Links” menu which has ‘Today’s Racing’ as its first option, while the five next races to jump around the country also has its own column. However, Betstar do their best to ensure sports betting enthusiasts aren’t left out by also listing the next five sporting events. One of the key differences between Betstar and Ladbrokes is the promotions on offer. This is important to note for those punters who already have a Ladbrokes account and are wondering why they should bother signing up to Betstar. Betstar also tries to differentiate itself from other Australian sports betting websites by sending out tongue in cheek emails and posting humorous sporting news pieces on their ‘Betstar Blast’ blog. Not everyone is a fan of these emails and blogs, but occasionally Betstar manage to hit the right note with something punting related that is very funny. Many Australian punters will be happy to know that, like Ladbrokes, Betstar offers an ATM card which allows direct and instant access to your winnings and account balances at ATM’s or in-store at Eftpos machines anywhere in the world that accepts Visa. This is a hugely popular move in the Australian sports betting industry as there is nothing more annoying then it taking three days to withdraw punting winnings. Betstar offer a fairly standard, yet still extremely valuable $250 betting bonus. Eligible punters will receive this betting bonus to use as bonus bets when they make their successful first deposit. This is the same amount bonus as Betstar’s sister site Ladbrokes, so make sure you cash in on each bonus at both sites! To ensure you pick up the full BEtstar bonus, new punters must deposit at least $250 which will be matched at 100%. So basically, deposit $250 and have $500 to bet with! If you don’t wish to pony up a $250 deposit to begin with, then Betstar will match any deposit amount up to $250. That means a $50 will net a $50 bonus or a $100 deposit a $100 etc. The bonus amount can be used on any bets or wagering products that you like, there is just a standard minimum turnover of at least 2x times your bonus amount. This is a great betting bonus, so be sure to click on the links here at Before You Bet and sign-up to Betstar today to start building your sports betting bankroll! Don’t forget to check out full terms and conditions on the Betstar website before signing-up so that you understand fully how the bonus works!